Talk about brand allegiance… | Clear Inc. Yesterday I was enthralled, as most of my geek brethren were, by the subtle announcement of the new iPod shuffle by Apple. At first, when I was watching the demo on the Apple site, I thought it was a joke. It’s ridiculously small. Like stick of Trident gum small. 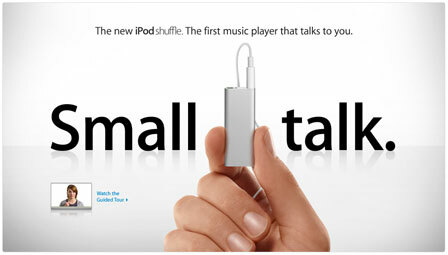 And I thought when I bought the very first shuffle, and it was the size of a PACK of gum, that it was astoundingly small. And even though I only used my shuffle 1.0 for a short while (I convinced myself that my first and second gen iPods were just too darn bulky to wear on my albeit short subway rides to the office), I abandoned her when her tiny offspring was born, the shuffle 2.0. The shuffle 2.0 was cute as a button when she emerged from the womb in Cupertino. You could go to any Apple Store and see crowds of men, women and children all cooing over her like new parents in a maternity ward with their faces pressed against the glass. And she had a clip. A clip! No more lanyard that I never used. Okay, I used it a couple of times, but even that was a bit too dorky, for even me. This baby clipped right on to what you were wearing. And it came in colors. Colors! And I had to have one. I was convinced that it would make my life oh-so-unincumbered at the gym. Plus I was fed up of strapping my iPhone 1.0 to my arm band and having it slide down while running on the treadmill all the while sweat pooling up against he neoprene case. And let’s face it, everyone had stopped staring at my iPhone once more and more people started buying them. I had to have a shuffle 2.0. And as if to sweeten the deal, they had a product (RED) one. Now I HAD to have one. And so I did. And it did change my gym life—for those times when I actually went. And now it sits on my desk staring back at me just bursting with music, begging to be played. (I swear I’m going to start back at the gym any day now). And I think that if I just had this NEW shuffle I would DEFINITELY start back at the gym. Because this one talks to you. Talks! Even if you have to go through a ridiculous pantomime of clicks and holds of the half-Chicklet-sized set of buttons on the ear buds. It’s like learning morse code. And then, this beautiful voice from 1985 says the name of your song. But wait, if you hold it down longer, it will tell you your playlist. All the while leaving you guessing if it was actually speaking English. Hell, it’s worth buying it to just hear it try to pronounce the names of your artists. I’d buy it just to hear it say “Hoobestank.” And I’m sure you’d see me flying off the back of the treadmill as I tried to remember if it’s seven clicks and then two long holds or four clicks, a short hold, and then three more longish clicks before it would tell me which song I was thinking about buying when I got home. And like ALL Apple products, if it didn’t hook me instantly, by the time I woke up the next morning I would know I had to have it. And why is that? I’ll give you two words: Brand Allegiance. And where Apple is concerned, everyone else can just move the hell out of the way, because nobody has brand allegiance like Apple. It’s an allegiance so strong that one feels compelled to buy not only the products that you “need” but even those that you don’t! Apple symbolizes all things cool and definitely all things visionary. And it appeals to ALL age groups, from a child getting her first shuffle to my father’s 87-year-old Godfather who bought the newest iMac and carries it in, CARRIES IT IN, to the Apple store weekly for One-on-One lessons with a genius. Now that’s genius. Apple is synonymous with innovation. And innovation is being able to tell people what they need before they realize they need it. It’s not about keeping up with trends or technology, it’s about blazing the trails of tech and setting the trends that keep your competition chasing after you with their “me too!” products. Take the Newton for example. “Newton?” you say? Yes, Newton: Apple’s Cro-Magnon PDA (weighing in at about a pound without the batteries). It seems silly now but that technology is what spawned the Palm Pilot and Palm OS and the boom of PDA technology. And talk about trends, remember when the iMac came out in five delicious colors and then everyone’s products, electronic or not, were coming out in translucent grape, lime, or orange? It’s not that long ago. Heck, I think I still have a bondi blue USB floppy drive somewhere in my apartment. And still, Apple can do no wrong in the minds of its more zealous followers. I’ll give you an example of one such follower…my G5 tower passed away recently and it was like a death in the family. And she died a horrible death. She actually bled. That’s right, bled. When I took her to the Apple ER, there was actually day-glo green “blood” dripping out the back. Engine coolant. You see, the G5 chips ran so fast and so hot that Apple introduced a liquid cooling system, much like a car’s, to lower the temperature inside. And all the while I’m reeling from the shock of this horrific, tragic death, I’m thinking “How FREAKIN’ COOL is it that my computer had a freakin’ liquid cooling system inside?!?! !” It’s just so…Apple. Form plus function. They didn’t have to use an LCS (liquid cooling system as EVERYONE in the know calls it) 😉 They could have easily used several large fans that would have kept the costs down and the noise up. But that’s not Apple. That’s not smart. That’s not visionary. So if anyone wants to come over and see my new shuffle 3.0, just wait a couple weeks for me to stop going to the gym again and you’ll find it on my desk cuddled with my red shuffle 2.0 keeping her company.